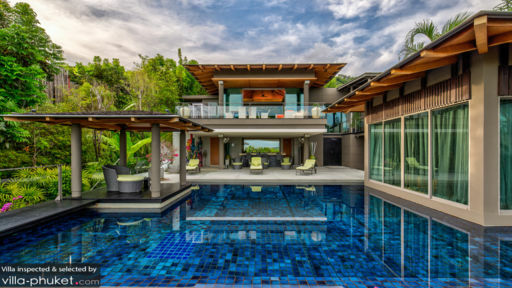 If you’re looking to spend time in a more tranquil and serene part of otherwise bustling Phuket, then Villa La Colline near Layan beach is one of the few luxury resorts offering a respite from busy crowds with utmost privacy and the advantage of an almost stranded beach. The azure waters, sandy shores, and sparkling horizon are the right ingredients for a perfect holiday in the tropics. The villa is part of La Colline with a collection of exclusive resort-style properties. 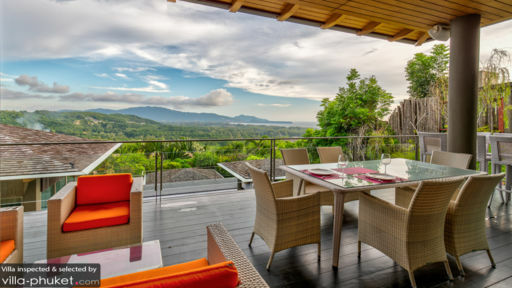 Villa La Colline has three bedrooms, open-plan living and dining areas, a gorgeous swimming pool, and spectacular views across the ocean and lush flora. The landscape of the villa is such that it incorporates each aspect of nature within the compound. The winding staircase in the garden is a beautiful addition where you can enjoy a more immersive experience. The three bedrooms are located around the pool on the lower level each leading to the pool deck or garden via glass doors. Furnished with double beds, TVs, lounge chaise, and leading directly to the gardens, the bedrooms are ideal for a comfortable stay. There is ample space for you to store all your belongings with ease. The bedrooms come with en-suite bathrooms as well with necessary amenities. As you enter through the antique doors, you will be greeted by a most resplendent view of luscious and verdant tropical greenery, the dazzling ocean, and vast skies. The villa is spread over two level where the lower level comprises a splendid swimming pool accompanied by a pool or sun deck with sun chairs, a rattan seating, as well as a poolside sala with shaded sitting. Upstairs you have an alfresco dining area, and a high-table perfect for sunset cocktails and delicious feasts. Designed to bring in the outdoors inside, Villa La Colline presents open-concept spaces with glass doors that slide open to reveal either the swimming pool or the terrace upstairs. You have access to both right from the living room and the outdoor staircase. Surrounded by luscious flora, tropical jungles, and other resort, the villa is serene and calming. The living room is well-furnished with a comfortable, modular sofa that sits facing the stunning view. There are futuristic, edgy interiors, a bookcase with some entertaining titles, and an adjoining terrace overlooking the verdure of the region. For dining, guests are free to choose where they wish to eat, whether it is outdoors or indoors as there is dining available in both areas. There is ample seating for guests to eat in peace and together. Delicious meals prepared in the fully-equipped kitchen or by professional staff can be relished at the villa. All the while you are sitting against a gorgeous backdrop teeming with dense, thick trees, native plants, and the sounds of nature. From a villa manager who takes care of the guests with their queries and any arrangements to housekeeping staff, the property runs smoothly without a hitch. The villa even provides airport transfers to take you from and to the airport. If you wish, you could wish for breakfast, lunch, and dinner to be prepared by the house chef. The villa is merely five minutes away from Layan beach that is a serene destination with pristine white-sandy shores and the crashing waves of the ocean. Since the area is fairly less crowded, you will have the beach all to yourself. Enjoy a restful and rejuvenating holiday by taking long, tranquil walks along the ocean and having a moment to yourself.